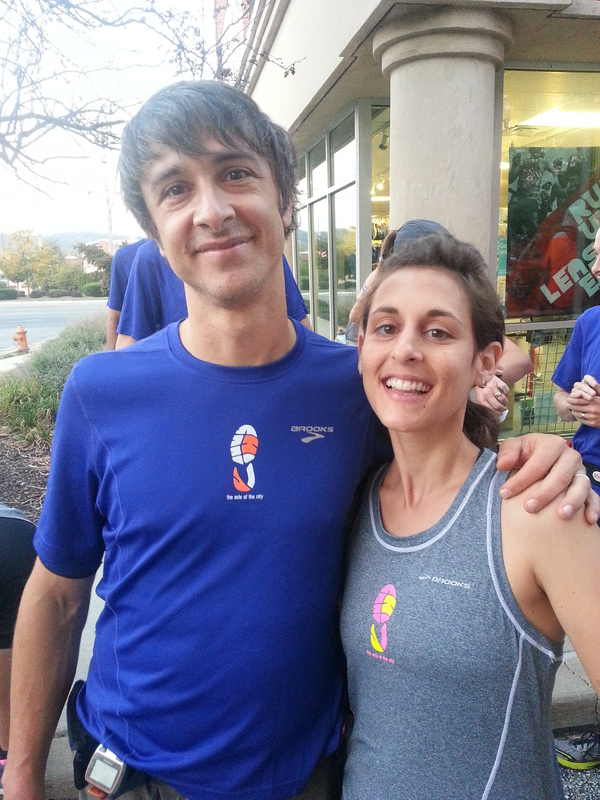 Runners Inspiring Runners – John Shafer | So What? I run. One of the most inspiring runners to me is my personal trainer, who also coached me for my first half marathon with Charm City Run. When John runs, you can’t help but be in awe of his form and grace. Not only is he a great runner, he is humble and genuine. He’s a constant coach even while he’s running a marathon, checking in on runners when they’re not looking so good and giving them a pep talk to help them push through the wall. John turned to running after living a very unhealthy lifestyle that was taking him down a dark road that wasn’t going to end well. He now helps people by coaching half and full marathon groups and also with personal training. Below is our interview. JOHN: It was literally for survival. I was in my early 30’s and had been told for the millionth time by a doctor that smoking and being a type 1 diabetic was going to end really poorly for me. Not sure why but I started to believe her. I had smoked since my mid-teens and didn’t really know what normal, non-smoking people did. I had finally quit drinking 5 years earlier so I was truly running out of the things that had defined my character. I joined a gym that I could afford and showed up that first morning after having quit and tried to fake my way through what I imagined a workout would look like. The elliptical looked odd to me and I didn’t want to dress in tight pants like the people on the bikes so I decided that maybe I could figure out a treadmill. I ran about 3/4 of a mile and then puked in a giant garbage can on the fitness floor. I hadn’t meant to but I sort of caused a scene. Concerned ladies asked me if I was alright. I didn’t know at the time but I had just inadvertently found what was going to allow me to take control of my life. ME: What do you find is the most challenging part of running? JOHN: Tuning out the wimpy voice that tells me to stop when I’m starting to get really tired. Sometimes it talks louder than others. ME: Tell me about your first marathon and how it changed you, if it did. JOHN: It was Baltimore and I really never had any intention of running a marathon. Got dared to do it by a few of these weird runner types who I now found myself hanging around. Waking up at 5am on Wednesdays to do track workouts at the old Johns Hopkins track seemed sort of strange but I couldn’t help but admit that I liked it. I wanted to learn how to get better and went out of my way to find out how. It taught me that it’s truly incredible what someone can accomplish if they have a sound plan and the will to sacrifice in order to achieve it. But mostly it was fun and exhilarating to be doing something new. I was becoming more disciplined than I ever thought I was capable of….I was a lousy kid in the past. ME:. How many marathons have you ran in and which one was your favorite? Why was it your favorite? Dallas was my PR(3:11) and really felt as though all of the training and nutrition came together perfectly. I remember saying to myself “this is working!”at mile 23 and that doesn’t happen too often for me. ME: What’s the most important part about training for a marathon? JOHN: I’ll give you two…..Consistency and resolve. ME: Have you ever bonked during a race? How did you get through it? JOHN: Yes, more times than I’d like to admit. It’s always as a direct result of going out to fast in the beginning and burning through my glycogen stores. I’m trying to get through it by not allowing it to happen anymore:) My wife, Lauren, is now a nutrition coach so we’re really trying to get a strong handle on our fueling needs. This training season has been significantly better than the past. I’m psyched to try it out in Richmond. As far as getting through it, you hang on for dear life and vow never to repeat the same mistake again….Sounds fun, huh? ME: How has running changed you, if it has? JOHN: It’s made me more optimistic and less cynical. It’s shown me that there are people out there who will help one another out of the goodness in their hearts. It’s given me a well above average VO2 max after years of being well below. I’m able to take care of my diabetes and, more importantly, I’m able to help and take care of other people. ME: What’s the funniest thing that has ever happen on a run to either you are a running partner? JOHN: Does going to the bathroom midway through a big group run under the Jones Falls count? I was then asked a mile or two later why I chose to run without socks. New product….wicking toilet paper. ME: What is your go to pre-race meal? JOHN: Whole wheat pasta, red sauce. Lots of water. ME: Who is the most influential person to you and why? ME: If someone is starting out and is thinking about training for a marathon, what advice would you give them? JOHN: I would tell them to surround themselves with cool, fun runners. Running can be a solitary sport and I’ve trained alone in the past but there’s really no reason to isolate. Some of the required training IS tough but it’s much more bearable if you have some friends to joke about how miserable it is. And then you’re going to need a running coach, a personal trainer, a physical therapist, minimalist shoes, a sports psychologist, motion control shoes, a fuel belt, lots of gels…..Screw it, just have fun. This entry was posted in Runners Inspiring Runners and tagged diabetes, inspiration, Marathon Running, Road Running, Runners Inspiring Runners, Running, type 1 diabetic by SoWhatIRun. Bookmark the permalink. He sounds pretty awesome! 🙂 And inspiring me to want a coach! So great to read and see that you are happy and healthy, John! I am super happy for you, and even a bit inspired! Cheers to both of you! If it weren’t for John, I wouldn’t have continued on my journey to holistic health and wellness! John has, and continues, to make me believe in myself and keep striving! Love John and Lauren!